The Grand Palace is one of Thailand’s holiest sights. Visitors must be dressed appropriately in order to enter the grounds. Your guide will advise you in the morning before levaving hotel if any changes to your attire is required. Gentlemen: long pants, shoulders are covered. Ladies: long pants or skirt knees are covered, shoulders are covered. Visitors are required to dress appropriately. Sandals or flip flops are allowed. The following clothes are strictly not allowed as outer garments for both ladies and gentlemen:Shorts, mini-skirts, short skirts, torn jeans, see through, quarter length trousers, vests, tight fitting trousers or leggings and scarves. There are the pants and sarong for rent 30THB/1piece at the front of the Grand Palace and The Emerald Buddha Image Temple incase you do not want to carry your pants. 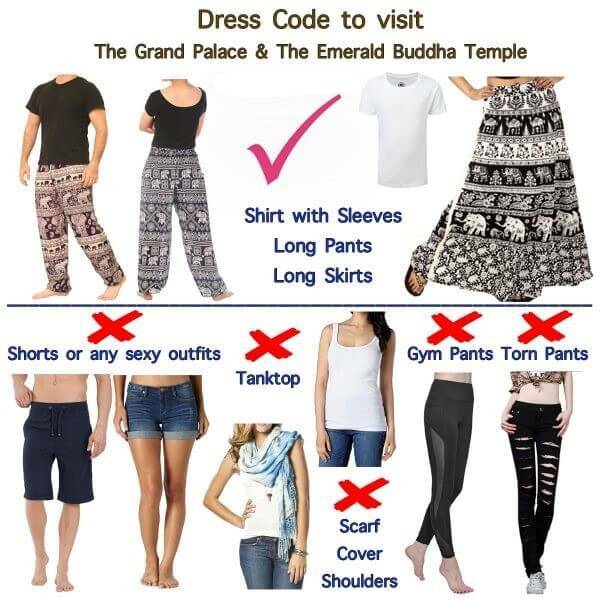 - Other temples in Bkk; you can wear shorts but knees and shoulders are covered.If you have and questions please ask. There are also some less strict notes to be adhered to when visiting Ayutthaya. Gentlemen: short pants down to knees covered and shoulders are covered. Ladies: short pants or skirt down to knees and shoulders are covered. Sandals and scarves cover the shoulders are allowed. These following clothes are strictly not allowed as outer garments for both ladies and gentlemen: Short shorts, mini-skirts, short skirts, torn jeans, see through, vests, tight fitting trousers or leggings. Please remember that all “ruins” in ayutthaya are still functioning temples and religious sights and we must be dressed modestly as we would in any other place of worship.